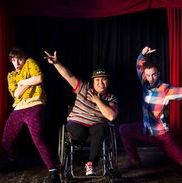 A solo work created by Laura Dajao influenced by sign language, Hip Hop, Contemporary, Waacking and Locking dance styles. Laura collaborated with Jnr Williams, a singer song writer and producer Simon Kusnierek to write a song of the same name, based on a personal experience of being lost and hurt after a traumatic event in her life. But then finding hope. The piece uses the song and explores the emotional journey of pain, loss, confusions and the realisation and acceptance of the situation. 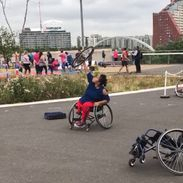 Laura was given a grant from Greenwich International Dance Festival to be able to develop the work further in order to perform at Liberty Festival/National Paralympic Day on 15th July 2017. Click here to request footage of this performance. 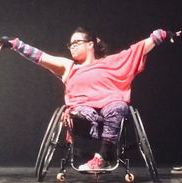 As a participant of People Dancing's 11 Million Reasons To Dance exhibition, Laura was invited to take a residency with South Holland Centre, Spalding to develop her choreography and to run workshop for the community based on the exhibition and CPD for professionals wanting to learn more about her inclusive practice. 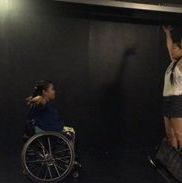 The residency ended with a sharing of the developed work, work from local groups with disabilities and a performance of Night at the Theatre by Casson & Friends, which she also featured in. 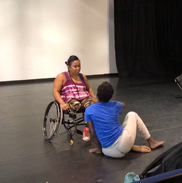 For this performance Laura developed an iteration of this solo with Hearns Sebuado - working on more motifs using sign language and a deeper narrative in #FMSDuet. 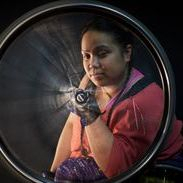 Laura was also invited to perform at WoW Festival (Women of the World) at Southbank Centre, London.